Malcolm Mackenzie knows the moment he sees Lady Mary Lennox, daughter of an English earl, that she is the one for him. The trouble is, Highland clans are rising to join Charles Stuart, who has landed in Scotland and headed for Edinburgh where Mary’s family is currently residing. Not only that, Mary’s father is in thick with the English government, and certainly doesn’t want his daughter anywhere near a Highland barbarian. Plus, Lady Mary is already engaged to another. Malcolm, who considers himself neither Jacobite nor loyalist, wants only to build up his business, avoid the uncertain tempers of his father and oldest brother, and win the hand of the beautiful and lively Mary. 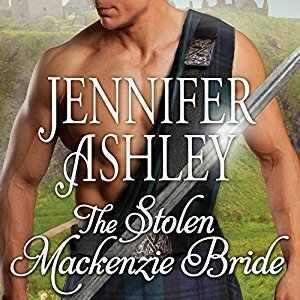 He makes plans to sweep her away to his castle north of Inverness, but his four interfering brothers and father, not to mention this annoying uprising, keep getting in the way. Mary Lennox believes she’s happy. She is fine with going through with her arranged marriage to please her father, at the same time helping her sister to find romance. That is, until she sees Malcolm Mackenzie, youngest of the Duke of Kilmorgan’s five sons, lounging like a lazy wolf in the middle of a proper English soiree. It isn’t only his kilt that makes him different from her English acquaintances in Scotland, but his predatory air, his golden eyes, and his casual arrogance. Soon she finds herself under the scrutiny of this man, and of his entire Highland family. Her ideas of duty and happiness splinter and fall away, as Malcolm makes her face the truth about herself and her life. The dark winds of change, however, are flowing around Malcolm and Mary. Scotland is drawn inexorably into the battle between the Jacobites and the armies sent by the English government to crush the rebellion. Scots fight Scots, loyalties shift, and Malcolm finds himself plunged into a fight he didn’t want, one that will change his life and the Highlands of Scotland forever.